It gives me great pleasure to announce that 2016--an unrelentingly gruesome year in many respects--is almost behind us. This website has been quiet for some of the year due to other commitments but shall spring back to life in the new year--enormous thanks to the millions who have continued to visit and enjoy these magnificent letters. 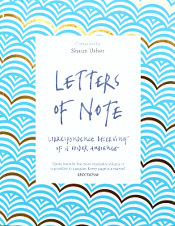 Thanks, also, to those who have bought the gorgeous Letters of Note paperback that came out recently, and, for that matter, all other "books of note"which can be found on this handy website. Final thanks must go to everyone who has bought tickets to Letters Live: these events continue to go from strength to strength and never fail to take my breath away; without you, they couldn't go on. Our last show of the year, and arguably our most satisfying to date, took place last week in Brixton Prison and was an evening I shall never forget. More info here. As for 2017: it looks set to be a corker, not least as I am soon to launch Speeches of Note, a project I've been planning for the past few years that I cannot wait to show you all. 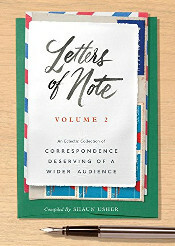 Until that time arrives, however, as has become tradition, below are the most popular Christmas-related letters of note. A cheery letter from John Steinbeck, on Christmas, gluttony and immorality. A fantastic letter of thanks from Sylvia Townsend Warner, in response to a seemingly mundane Christmas gift. 60-year-old Walter Page writes a charming letter to his grandson and discusses the things they have in common. One of many letters written by J. R. R Tolkien to his kids, in the voice of Father Christmas. A soldier writes home to his wife on Christmas Eve and describes the moment British and German troops put down their weapons and greeted eaach other. Mark Twain writes to his daughter, as Santa Claus.